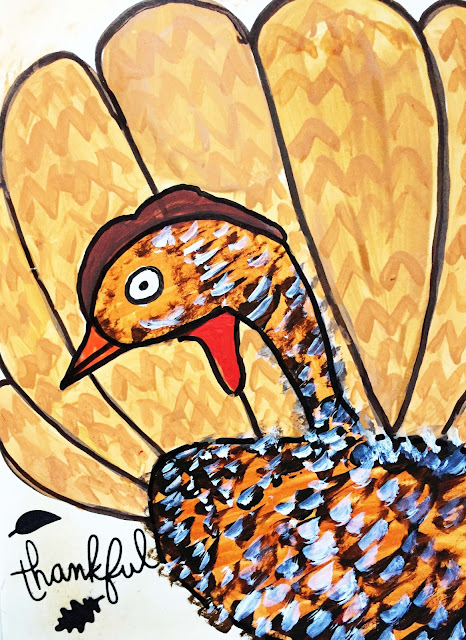 I made this silly turkey page in my journal. I want to wish all of you that celebrate Thanksgiving a happy day. And I want to say thanks to all my blog friends and readers. I am thankful I've gotten to know all of you. And to all of you who may not celebrate Thanksgiving, I want to wish you a good day too. Your "silly turkey page," as you call it, is adorable and makes me smile! Happiest of Thanksgivings, Erika. Thanks for all your visits during the year. It's son ice to have a new blog friend. And I am thankful that your husband's surgery and recovery is going well. Enjoy that turkey -- the cooked one! Happy Thanksgiving to you dear Erika! I like your turkey-painting very much! Fabulous colors! Happy Thanksgiving Erika, I am so pleased to have met you here in blogland. I was gone when this went live, but I hope you had a marvelous Thanksgiving, too. Having your husband home was probably the most important thing to be thankful for. Haha! - an amusing turkey, a good bit of arty fun. I live in beautiful New Hampshire! So, want to know about me? I'm a wife and mom. I have travel addiction, love photography,art and science,am a voracious reader. I adore my 2 dogs and am wanting another cat. These guys are all spoiled. My profession is as a high school biology teacher, but I am an artist inside and and have my own art studio at home which is how I like to spend my spare time. I also love gardening, baking and shopping is big on my list of fun things too. Thanks for looking and enjoying (I hope) my blog. My art is my art- and thanks for not borrowing it without my permission.